I like this church, so I went into the garage sale, although my expectations were low (rightly so) I did find about two meters of broad cloth for $1 AU. or as they say here "one gold coin, luv". I had to take the Jeep to town to be serviced. They always want the car to be there by 9 a.m., I almost always make it there by 10 a.m. Normally I bring my bike and go to the bike trail, but alas the weather had other ideas. I decided to finish up my shopping for Zok's Xmas stocking. I am usually apprehensive about such extensive social interaction, my waking thoughts are more appropriate for Edie Beale. I am not even sure where they come from. Some previous life that doesn't believe this quiet life can endure. The reality is that I jabber away with the shop keepers as if they were actually my friends and I somehow end up with phones numbers given to me by strange men (I think I said this doesn't happen to me here in Tasmania as it does in other places, that was mis-stated). Except for candy I think Zok's stocking is done! I even got my craft supplies that if I have any luck will become Xmas cards. I had to waste 5 hours, on foot, and well what can I say? When I ran out of money, I ended up in the Pub. Platypuses not Platypi is the proper plural. 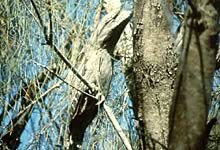 Tawny Frogmouth pretending to be a branch. One of the Platypuses hangouts. I used to go to this part of the Peter Murrell Reserve for the birds. There is a rare bird here called a forty-spotted paralote which isn't very easy to tell apart from a regular paralote. I saw my second Tawny Frogmouth here. The place is also lousy with Silvereyes, fancy honeyeaters, and of course the Superb fairy-wren. Then came the day I saw my first PLATYPUS. Sure, sure, I'd seen platypuses in zoos but not just outside, near my home! Good things happen from watching the platypus and he pops to the surface, swims a bit and then dives down, I get so enamored that I usually sit still long enough to see other creatures, like the bandicoot. This was my first trip since returning home, and I am sad to say that all I saw were birds. We've had so much rain that all the gullies were full and some were doing a fair imitation of water-falls. "leaving the page of the book carelessly open, something unsaid, the phone off the hook"
There are a lot of unpaved roads where I live. Beach sand, beach rocks, gravel, dirt, Eucalyptus strewn pathways. Two seasons each year put a person under threat of rain. Often this rain consists of five intense minutes of down pour, this five minutes will happen to you if you wearing nice shoes. After the death of two cute pair of shoes, I started to obsess on the proper shoe wear for my new country life. I found two pair of high wedge cherokees via Ebay, one pair was quite a hassle. Buying that pair consisted of many emails, cut and pasting several paragraphs of ebay rules, and a threat to the seller before I got them shipped to my girlfriends place in Santa Monica. I remember when a shopping obsession didn't take more than a jaunt out of the city limits to a thrift store, or about an hour of internet search. Sure there is ebay and its partner paypal which we have in Australia, but on the other side there is incompetence, quarantine, customs, and isp addresses to get in the way of a girls purchase. I decided I needed a pair of Clarks Wallabees about two years ago. I got mine this week. Even though Clarks is a UK company no one, nor any store that I asked in Australia had ever heard of the company. Internet shops didn't seem to carry my size. I thought while in the U.K. I would have more luck, and although there are plenty of Clarks shoe stores, I was told they were discontinuing the classic line of the Desert Boot and Clarks Original which is why none of the stores had any stock. This brought on a bit of panic and also stopped dead my hopes that I'd find them for under the list price. I did find these online, in an American store, which shipped internationally. They were quick on the charge which turned out to be in our favor as the exchange rate was much better then than now. I had to send three emails, and leave two messages from here to get an answer about where the shoes were. I finally got a call and an explanation about the company changing owners. There is now a problem about the billing which I need to call about, but hey I have the shoes! Wedge heel to stay out of the dirt and give a bit of height! Waterproof! So ugly they are cute! Good for walking! When Zok and I first came here the airport was half the size it is now, there was one airline and parking was unmonitored and free. About a year after we moved here, Virgin Blue added a route. Now there is a new terminal with its own baggage claim and a new airline; Tiger. There are three snack bars instead of one, and three gift shops instead of one. Parking now costs about $4.20 for the hour but usually there is a close spot. Plus one could just drive to pick up or drop off. Also everyone travellers and those left behind can go to the gates. Travellers still have to walk the tarmac to get onto the plane which I enjoy. As you can see the airport is yet to be really busy. However they have added a roundabout, and a hotel so I think change is coming. Zok is starting his flying lessons to get his pilots license. I liked this plane best-Zok says that it is too light or was it too small? Either way he is going for a larger plane because that license will work for this plane but not vice-versa. Just the propellers? I am actually nervous about Zok flying a small plane, I am working hard to just squash any and all thoughts associated with the event. No 'Bye, bye Miss America Pie' or thoughts of the various small craft crashes that come to mind. So I am embracing Australian made Sparkling Wines. They cost per glass about the same as a glass of wine. This lovely pink bubbly, which is a bit sweet making it acceptable to Zok's palate is $14 AU or by today's conversion $9.20 US. I try to embrace 'Australian' whenever I can. I try to substitute items so that the original items will fade into the recesses of my memory. I have been surprised how easily the process of forgetting works when a person is bereft of any cues to invoke particular memories. Actually, substitution doesn't work well for suppressing, but substitution can take the edge off of the remembering. I suppose that when we have unusual heat (Tues was 55, Weds was 85) followed by high winds, and then silence and a sudden stillness; which here predict a storm-will always remind me of earthquake weather. Often we don't even get hit by the storm, all we get are a by-product of rainbows, which are much easier on a person's household then an earthquake. The first year I lived in this house, I'd hear a single Cockatiel flying by, screeching as they do and I'd think 'Eagle! ', and I would race outside and never see anything. I would hear the sound a lot, and when Zok was home, I'd say 'Did you hear that?' and Zok would always respond 'No'. Zok's hearing is selective at best and downright hearing-aid worthy at times. This year though I have had the satisfaction of Zok saying 'Did you hear that? Is that a bird of prey?' and my being able to say with confidence 'No, it is one of the Cockatiels'. (Zok misses a lot being gone so often). Then I had the ultimate satisfaction of the whole flock coming by. The photos are lacking because in my haste to get outside I scared half of them off the tree. I have been waiting a long time for this track to open. The track is a decent one-hour walk each way, but I was a little let down. 'Alum Cliffs' track doesn't actually take you to the Cliff part. Actually, I am not sure the Cliffs are visible from the land side but I only have the map to go by. Next time I will have to go off the trail and see what I can find. My record for finding the sights is not a good one. I spent a year looking for the 'blowhole' which is near our house. I saw the small signs under street signs in my neighborhood that said 'blowhole', and I would hear people mentioning the blowhole every so often. I would often walk the whole length of 'Blowhole Road' which I assumed correctly was named so because of its proximity to the Blowhole. I sort of imagined the blowhole being a type of geyser. Then one day in the post office I noticed a card with photo of the blowhole on it. The card ended up being very key because otherwise I would have stood in front of the blowhole and never have known that was what it was. When I did finally find the blowhole it turned out I had been walking by it all the time. Sanchez continues to take over. I only have one word to say about shopping for furniture in the Hobart area, Levitz. There are two second hand shops near by located at Margate Train. Yes, there really is a train. Zok has some friends from Sweden coming to stay here after Christmas. I have Monte and Roberto coming in early February, which is very exciting. I wanted them to be able to unpack their things. Zok and I have our closets (built ins is what the Aussies say) crammed full so we needed something additional. Zok went a bit crazy and bought a chest for the end of our bed which is awesome for me because now clothes won't be on the floor. 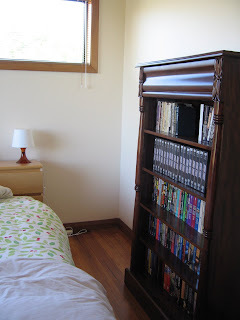 He also got another book shelf which you see here as well. 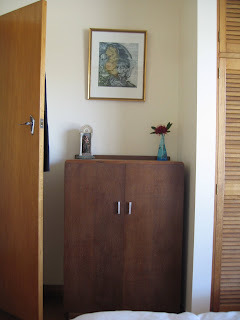 I found a huge, old deco style wardrobe for about $68 U.S. to put in the garage this provided the means to get the rollaway rack out of the guest room. Basically I am set up pretty, so COME ON OVER. I met my friend Heidi at the beach cafe by my house. She really got the short end of the deal, for one thing I think I short changed her on the bill, for another she basically got the same wood fired pizza I did, but they charged her double. Mine was on the appetizer list but seriously, they were the same size with the same amount of ingrediants. We will have to pay more attention next time we go there. I blame my inattention on the two glasses of sparkling wine I had on a basically empty stomach. Lastly, Heidi and her husband have their own business; they make Cakes. Let me tell you that Zok and I are always trying slices of cake from the bakeries, and faux gourmet grocery shops. There is a lot of bad cake out there. Just the other day Zok got a slice of cheesecake from Liscombe, the crust was like a pie crust and inedible, also the cake was topped by this sort of lime meringue. Awful. Heidi though makes perfectly delicious cakes. She can also make them in any shape you could ever want. Although I am old-fashioned and I don't go in for that fancy stuff. Here is the cake she surprised me with. As I sat down to compose this post, I felt an intense pain, I jumped up, yelling out to Zok and starting to cry instantly. I knew what had happened, I had seen the wasp buzzing around the window earlier. I had forgotten to tell Zok who is an excellent insect catcher. There was blubbering about the injustice (not my best week, my twenty odd mosquito bits are still bothering me)-I made Zok do a google search about wasps and did as instructed. So here I am two Alleve and a shot of tequila later, sitting on a ice pack (that is all you need to know about where the wasp got me). Oh, of course the tequila was my idea not one from the ask a M.D. sites. 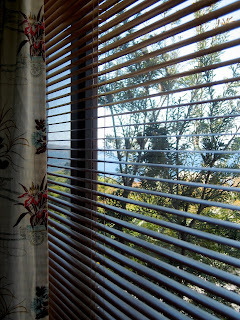 Luckily, as I gaze out the window I see the ocean,I can notice the tide getting higher, and the wind causing small white caps on the surface, moving to the East. But if I lose my focus I can see the neighbors yard. The neighbor who requested that we cut our big Gum tree down. The neighbor who hasn't bother to lift a finger on his now so clearly visible side of the fence. He refused to take down the hideous tree you might see behind my new small Lilac Hybrid. That tree happens to be a certified Weed. Weed lists are circulated regularly as each citizen is supposed to at least keep their own yard weed free. Tasmania like the rest of Australia has constant problems with 'introduced' species. There is even a type of Lavender that is on the forbidden list. Next to the bird bath that I put onto the stump of the Gum, I want to plant Ornamental Grape Leaf, so that in Autumn I can have some fall colors. However, if he isn't going to do anything about his side, all I can hope for is that the vine beats out the crawling plant on his side. All in all, very annoying. Or perhaps that is the Wasp venom talking.